This former H937 model was updated with a solid western red cedar top and a vintage 12-fret neck with slotted headstock. The solid cedar top offers a nice warm tone with way more sustain than the original birch top. The neck assembly is steel reinforced and is very easy to play without any chunkiness. Perfect for songwriting, recording or serenading your sweetheart. 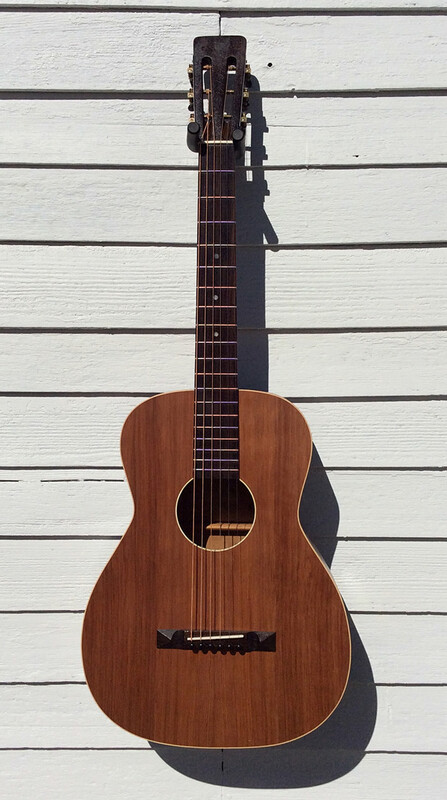 SPECS: 0-size body, 12-fret neck with slotted headstock, steel neck reinforcement, ladder-braced solid cedar top in natural finish, birch sides and back in original finish, bound top and sound hole, neck in black finish, vintage Regal tuning machines, soft, low “V” neck profile, rosewood fretboard with new frets, MOP markers, rosewood pyramid bridge, bone nut and saddle, boy pins. Nut width: 1 3/4”, String Spacing: 2 5/16“, Scale length: 24”, Upper bout: 9 5/8“, Lower Bout: 13 1/2”, Body length: 17 5/8”, Widest body depth: 3 3/4”, Overall length: 36 1/8”, Neck thickness at 1st fret: 3/4”, Neck thickness at 5th fret: 7/8”, Action: 1/8”, string gauge setup: D’addario EJ26 custom light gauge in standard tuning. CONDITION: Solid rebuilt condition. Bracing was updated to accommodate modern string tension. Crack free. Finish wear on neck/fretboard edge. Body has scuffs, crazing, squiggles, edge wear, with some gouge and seam shrinkage. Other work included neckset, new fretboard/frets, bridge and setup. SOUND: Sweet, resonant tone with sustain that definitely favors that barefingerstyle player. Generous string spacing and cool vintage vibe round out its appeal.